» AD9850 run at 3.3V or 5.0V ? AD9850 run at 3.3V or 5.0V ? I am doing a DDS VFO using a Arduino UNO. I have had some problems where the DDS just stops dead. I initially thought it might be my code doing something silly, but after I cut out all the code except for the bare minimum. I then had a look for a working AD9850 Arduino project and implemented that and the same thing happens. The DDS stops after a few minutes. I did note that aftre it stops, it needs to be powered down for about 30 secs. before it starts up again. As such it would appear that it is a temperature related fault. I have just reduced the DDS supply to 3.3 V which is on the UNO board and it is still running OK on either code. The data sheet permits operation at either level. Question. Anyone else play with these? What supply voltage do you run them at? Hi Lee. Good to see you again. The problem you describe looks veru much like latch-up of the AD9850. Use resistors in the wires between Arduino and AD9850. I think I used the 9850's in the past ... have to check that. I didn't need resistors since my AD9850 is very close to the Duino. Edit2: some more info. 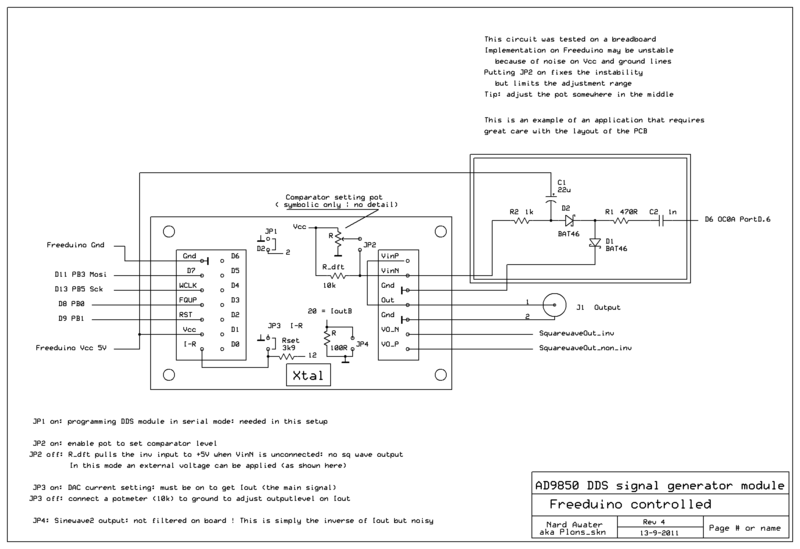 Corrected schematic f.i. 5V is what I used. No problems. And where I mention in my first reply to put a resistor in the line: of course that applies to the signal lines; a divider is even better: 1k in series, 10k to ground. I probably do need some voltage dividers now that I run the DDS @ 3.3 V & the Arduino at 5 V. If I can solve the problem regarding the failure at +5V then I will revert back to 5V. My DDS is also very close to the CPU. It is soldered on top of a proto-shield which is stacked on the UNO similar to your photo. A LCD-key shield stacks on that. I suppose that the LCD/keypad shield may have introduced additional stray capacitance could be an issue, but at the time of failure there is no activity on any of the interface lines at all. Ie. the DDS just sits there doing it's thing and then it dies...suspiciously like a thermal problem. I will blow little warm air into the stack & see if I can bring it on earlier. I have had it running at 3.3 V for over 18 hours without a problem, but I would still like to solve the problem as an academic exercise. PS. Are you generating AF or RF. I am interested in RF at 1.8, 3.6 & 7.1 Mhz. (I can try & run it at 1Khz @ 5 Volt to see how it goes). One day I will make a signal generator with it. FWIW: I wonder how it holds up at the RF frequencies you are interested in. Phase errors get nasty at higher freq output. Latch-up is what I experienced lately with a graphic LCD display: 15cm wire and it died. Needed a powercycle to recover from that situation. I think I have got on top of the problem. I found one of the other ones and it works OK at 5 V. It appears that the one that plays up has a TXCO which is rated at 3.3V, whereas the one that I am using now is rated to run at 5V. Mmmm that is a bit of a trap when the module is supposed to work at 5V as well as 3.3 Hi Hi! I have another one somewhere ( which is currently awol) & I will see what TXCO is on that & how that works. The purpose for the VFO is to drive an old marine AM transceiver (which was initially xtal controlled) for 160,80 & 40 meters. It is rock solid at the present time. I will measure the phase noise at some time when I get access to some equipment which can measure it. Until then I will live in ignorance... Hi Hi! Mixed the signal with an analog oscillator and listened to the frequency difference. OT: Isn't it a nuiscance that all our goodies tend to AWOL ?